After holding tryouts for Thanksgiving dessert, I of course ended up going in a completely different direction than any of the contestants. Let me explain how this happened. Kurt claims to not have much of a sweet tooth, but there are three similar sweets that he really likes. Those are Boston cream pie, eclairs, and profiteroles. 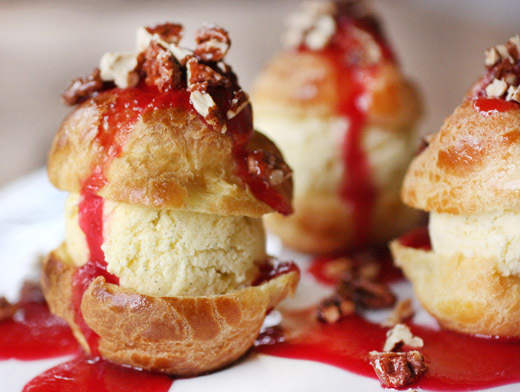 I’d made the first two at different times in the past, but I’d never made profiteroles even though we always order it when we see it on a restaurant dessert menu. 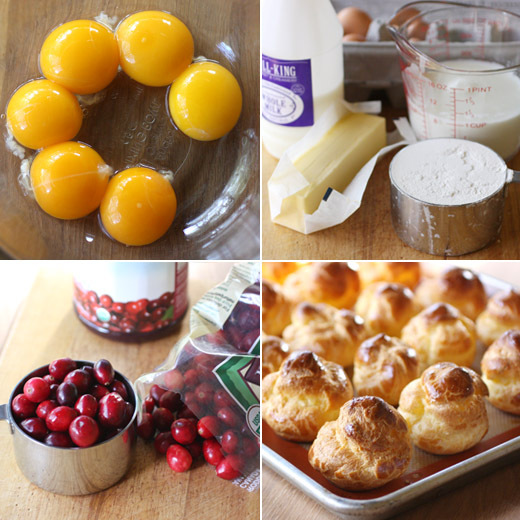 I had various ideas about how to change up the classic components of a profiterole to make it a more seasonal, Thanksgiving kind of dessert, and Kurt voted down almost all of them. He insisted plain, vanilla ice cream and standard chocolate sauce was the only way to go. There would be no pumpkin or cinnamon ice cream or spiced pate a choux or nutmeg dusting on top or any such thing. But, there was a Cranberry Caramel Sauce that I absolutely had to try. It’s from the October/November issue of Garden and Gun, and it belongs with a Pumpkin Bread Pudding recipe from Austin’s own Jodi Elliott of Foreign and Domestic. So long as the ice cream remained nothing but vanilla and the pastry puffs weren’t messed up with any spices, Kurt was willing to try a sauce other than chocolate. Then, I went ahead and made the Maple Spiced Nuts from the bread pudding recipe as well. One last, little change from the classic preparation wouldn't hurt. This dessert was made up of four parts, so I started by making the vanilla ice cream in advance to have one part completed and ready. I used the vanilla ice cream recipe from Eggs by Michel Roux which is nicely rich with six egg yolks and perfumed with seeds from a vanilla pod. Next, I made the puffs according to Ina Garten’s recipe in Barefoot in Paris . I like that she suggests pulsing the eggs into the pastry dough in a food processor rather than stirring and stirring by hand. That recipe is also available online. 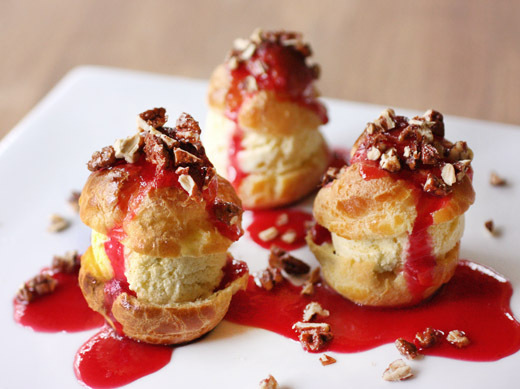 The great thing about choux pastry puffs is that you can refrigerate them or even freeze them, and then just re-warm them for a few minutes in the oven before serving. The tops will re-crisp and the airy insides will be as puffy as when they first came out of the oven. The third part of the dessert was the cranberry caramel sauce which was a simple matter of cooking sugar, water, and corn syrup until amber and then adding cranberries and pure cranberry juice. The berries and juice were stirred into the caramel and the mixture was brought back to a boil until the cranberries had all popped. Off the heat, salt and vanilla were added. After letting the sauce cool a bit, it was pureed in a blender, and then I strained it before letting it completely cool. Last but not least, the pecans were tossed with maple syrup, corn syrup, sugar, salt, and a mix of cumin, cinnamon, ginger, nutmeg, and cayenne. The nuts were baked until toasted through and allowed to cool before I chopped them. The hint of spiciness and bit of salt in the nuts was perfect with the tart and sweet sauce. And, I think plain vanilla ice cream was the way to go here since it allowed the flavors in the toppings to shine. In the end, we were both completely happy with these changes to the traditional profiterole for Thanksgiving dessert, but I don’t think I’d get away with messing with the classic eclair. Picking up a book and taking a trip around the world without even leaving the couch is a lovely thing. That’s what Naomi Duguid’s books offer. They’re always filled with photography of everyday life, beautiful scenery, and inviting food that makes virtual travel all the more real. Her latest is Burma: Rivers of Flavor of which I received a review copy. The fresh, bright flavors of the food with ingredients I already love like chiles, lime, and shallots drew me in quickly, and with every turn of a page, there’s another dish I want to try. 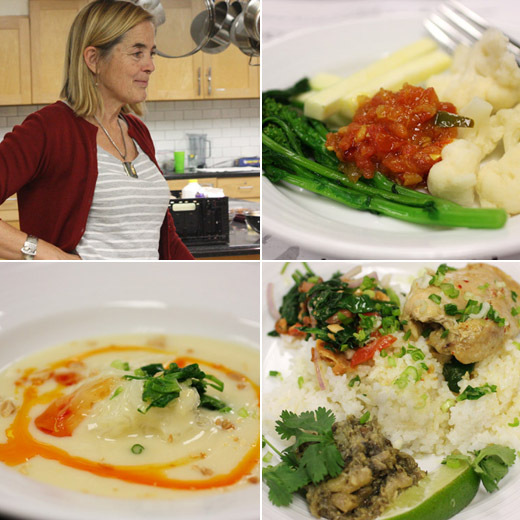 Duguid recently taught a class at Central Market Cooking School, and I attended with a media pass. She spoke about her visits to Burma, now officially called Myanmar, over the years and the style of eating she was introduced to there. She mentioned the rice meals that are accompanied by several condiments, vegetables, and salads and explained that when she ordered one or two things at a restaurant, she’d be served eight or nine items instead. Every dish of curry was served with rice, sauces, fresh and blanched vegetables, and side dishes. And, that’s the style of meal she prepared for the class. The food isn’t always necessarily spicy, but with the various condiments that typically accompany a meal, you can tailor each dish to suit your personal taste. Burma shares borders with India, China, Laos, and Thailand as well as having a long coastline, and the food has similarities with that of its neighbors. Although, I thought it was interesting that coconuts don’t grow well in most of Burma, so coconut milk isn’t a very common ingredient. Chiles fresh and dried, chile powders, shrimp powder and paste, toasted chickpea flour, roasted peanuts, fermented soybean paste, shallot and garlic oil, peanut and sesame oil, and turmeric are some of the basics of a Burmese pantry. During the class, we were served a tray of some fresh and some blanched vegetables with a Tomato Chutney made with tamarind pulp, dried chiles, fresh chiles, cilantro, and shrimp paste. It was a tangy, spicy, savory sauce to return to throughout the meal. The next dish was one of the simplest and most intriguing soups I’ve seen. A Silky Shan Soup was made by whisking chickpea flour, salt, and water in a bowl. More water was brought to a boil, and the chickpea flour mixture was slowly stirred into the boiling water. That was the soup. It was cooked until smooth and thick. The soup was served over rice noodles with several garnishes like chile oil, chopped roasted peanuts, shallot oil, palm sugar water which adds more of a smoky flavor than sweetness, and blanched pea tendrils. You can also make the soup as described and then pour it into a shallow pan and chill it. It will set up into a consistency like tofu, and that is sliced and used in salads. Other dishes included a roasted eggplant dish made sweeter with the addition of an egg; a chicken curry in which the chicken pieces had been marinated with a flavor paste of ginger, garlic, turmeric, and mild red chiles; and a salad made with blanched spinach that tasted so fresh and zippy I couldn’t wait to go home and make it myself. All of those dishes were served with rice, and the idea of the meal is to move about the plate and experience the different kinds of tastes. Nothing was too spicy, but taking a bite of a vegetable dipped into the tomato chutney delivered a kick. The chicken and eggplant were mild, and the salad dressed with lime had such big, bright flavors. After the class, I set about creating my Burmese pantry. I fried shallots and saved the shallot oil, and then fried garlic. I toasted chickpea flour which is sometimes a main ingredient and sometimes more of a seasoning. I bought dried shrimp and ground it in a food processor to make shrimp powder. And, then I made that fantastic Tender Greens Salad at home. 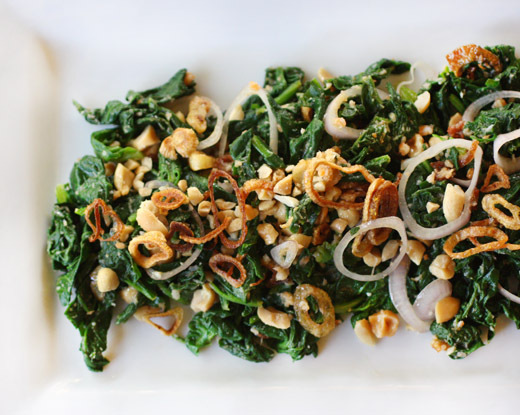 Some spinach was blanched, drained, and squeezed of excess water, and then it was tossed with fried shallots and garlic, dried shrimp powder, chopped roasted peanuts, toasted chickpea flour, shallot oil, lime juice, fresh shallot slices, and fish sauce. I’m looking forward to mixing those flavors in other dishes like a beautiful Chicken Salad Burma Style, Chickpea Soup with Lemongrass and Ginger, Golden Egg Curry, Kachin Salsa, Shrimp Curry, and Fried Rice with Shallots. It’s been a pleasure to get to know Burma from this book, and the food has been every bit as delicious as it looks on the page. Recipe reprinted with publisher’s permission. Excerpted from Burma: Rivers of Flavor by Naomi Duguid (Artisan Books). Copyright 2012. I learned this central Burmese version of the Shan dish Chinese Kale with Pork Cracklings from a friend in Rangoon. It’s very quick to make if you’ve got your pantry basics on hand, and it’s an easy and flexible dish to turn to when you have plenty of greens around. Start with any tender greens, briefly boil them to soften, and then chop and dress them. 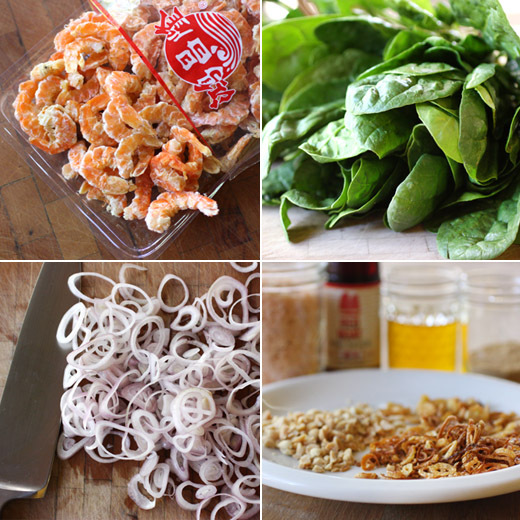 This dressing also works well for uncooked greens such as watercress or lettuce leaves (omit the fried garlic and reduce the dried shrimp powder slightly). Bring a large pot of water to a rolling boil. Toss in the greens and boil until just tender; timing will vary with the greens, but it should take no more than 5 minutes, and in many cases (spinach, for example) much less than that. Drain the greens and press out the excess water. Add the sliced shallots and the fried garlic or fried garlic–fried shallot mixture, and toss a little. Add the dried shrimp powder, peanuts, and toasted chickpea flour and toss. Add the shallot oil and lime juice and mix well with your hands, kneading the dressing lightly but firmly into the greens. Add the fish sauce or salt, as you wish, and mix well. 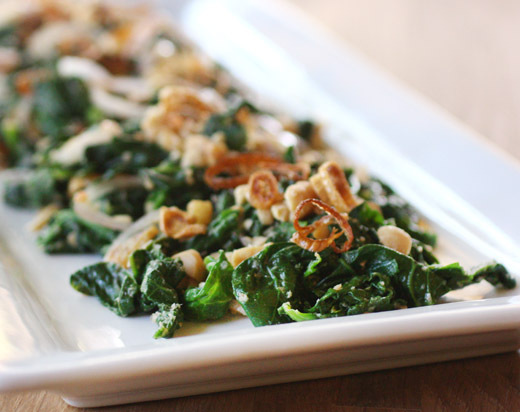 Mound the salad on a plate, top with the fried shallots, and serve. Here you get two pantry staples in one: crispy fried shallots and delicious shallot oil. Drizzle shallot oil on salads or freshly cooked greens, or onto soups to finish them. You can fry up shallots each time you need them, but I prefer to make a large batch so they’re around when I need a handful to flavor a salad. The trick with fried shallots is to cook them slowly, so they give off their moisture and get an even golden brown without any scorched or blackened patches. Once they’re removed from the oil and left to cool, they crisp up. Place a wide heavy skillet or a large stable wok over medium-high heat and add the oil. Toss in a slice of shallot. As the oil heats, it will rise to the surface, sizzling lightly. When it’s reached the surface, add the rest of the shallots, carefully, so you don’t splash yourself with the oil, and lower the heat to medium. (The shallots may seem crowded, but they’ll shrink as they cook.) Stir gently and frequently with a long-handled wooden spoon or a spider. The shallots will bubble as they give off their moisture. If they start to brown early, in the first 5 minutes, lower the heat a little more. After about 10 minutes, they should start to color. Continue to cook, stirring occasionally to prevent them from sticking to the pan or to each other, until they have turned a golden brown, another 3 minutes or so. Transfer the shallots to a clean, dry, widemouthed glass jar. Once they have cooled completely, seal tightly. Transfer the oil to another clean dry jar, using all but the very last of it, which will have some stray pieces of shallot debris. (You can set that oil aside for stir-frying.) Once the oil has cooled completely, cover tightly and store in a cool dark place. Makes about 1/4 cup fried garlic and 1/3 cup garlic oil You can use a similar technique to make garlic oil, but slice the garlic thicker (a scant 1/4 inch), rather than into thin slices, since it cooks much more quickly than shallots. Heat 1/2 cup peanut oil over medium-high heat, add 1/3 cup or so sliced garlic, and fry over medium heat until just golden, about 5 minutes. Lift out the garlic and set aside to crisp up. Store the oil as above. Fried garlic does not keep as well as fried shallots; refrigerate and use within 5 days. Dried shrimp are an important source of flavor as well as protein through most of Southeast Asia. In Burma they are often used powdered. The soft powder gives a subtle depth of flavor and also thickens sauces. Look for largish dried shrimp, more than 1/2 inch long if possible, and the darker-colored (more red than pale pink or beige), the better. Try to get shrimp that are a little soft rather than completely hard. The easiest way to grind them is in a food processor (traditionally, they are pounded in a mortar). Place the shrimp in a bowl with water to just cover and set aside to soak for 10 minutes (20 minutes if the shrimp are very hard and dry). Drain and pat dry. Transfer to a food processor and process until reduced to a slightly uneven, fluffy powder, from 1 to 3 minutes, depending on the toughness of the shrimp. Pause and wipe down the sides of the bowl occasionally if necessary. Store in a glass jar. Makes a scant 1 cup These are handy to have when you are making Burmese salads, so it’s worth making a cupful or more at a time and storing them in a jar. Buy raw peanuts (in their papery skins or not, it doesn’t matter)—you’ll find them in Asian groceries and health food stores. Place a cast-iron or other heavy skillet over medium heat, add the peanuts, and cook, stirring them frequently with a wooden spoon or spatula to prevent burning. Adjust the heat if necessary so they toast and change color gradually, in patches; as they heat up, the skins, if still on, will separate from the peanuts. When they have firmed up a little and are dotted with color, remove from the heat, but keep stirring for another minute or so. If using skin-on nuts, carry the skillet over to a sink or a garbage can and blow over it gently to blow away the loose skins. Rub the nuts between your palms to loosen the remaining skins and blow again; don’t worry if there are still some skins on your peanuts. Pick out and discard any nuts that are scorched and blackened. Transfer the nuts to a wide bowl and set aside for 10 minutes or more to cool and firm up. Once the peanuts are cool, place them in a food processor and process in short, sharp pulses, stopping after three or four pulses, before the nuts are too finely ground. You want a mix of coarsely chopped nuts and some fine powder. Alternatively, place the nuts in a large stone or terra-cotta mortar and pound with the pestle to crush them into smaller pieces. Use a spoon to move the nuts around occasionally; you don’t want to pound them into a paste, just to break them into small chips. Transfer the chopped nuts to a clean, dry jar; do not seal until they have cooled completely. Store in the refrigerator. For this distinctively Burmese pantry staple, which is very easy to make and store, chickpea flour is simply lightly toasted in a skillet. Chickpea flour is made from ground dried chickpeas (garbanzos) and contains no gluten (see the Glossary for more). The flour is available in South Asian groceries (the common name for it in India is besan), some health food stores, and specialty stores. Keep it in a well-sealed bag in a cool place, as you would any flour. Make this in any quantity you wish; I usually make 2 cups at a time. Use in salads to add a layer of flavor and texture, and also to thicken sauces and soups, as directed. Place a cast-iron or other heavy skillet over medium-high heat, add the flour, and use a wooden spoon to stir it frequently as it heats and starts to toast. Lower the heat to medium if it starts to brown quickly, and keep stirring to expose all the flour to the heat. After about 6 or 7 minutes, it will start to change color. Lower the heat a little and continue to stir as it gets a little more color, then remove from the heat and continue to stir for another minute as the pan starts to cool. The whole process takes about 10 to 12 minutes. Transfer to a wide bowl and let cool to room temperature. Store in a clean, dry glass jar, well sealed. What's better than a cocktail on Thanksgiving Day? A pitcher full of cocktails. 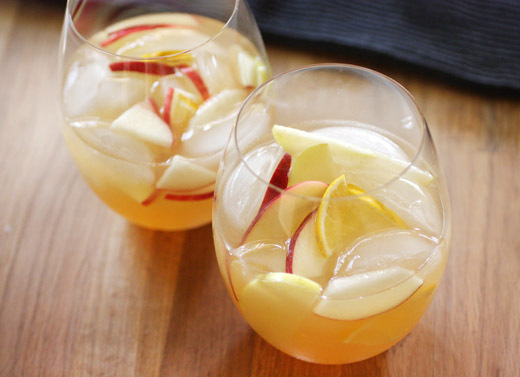 Sangria is the perfect solution, and this one is well-suited to the season. I saw this in the October issue of Food and Wine. Since it’s lower in alcohol than some other cocktails, you can sip a glass or two while cooking all kinds of things and not lose track of your oven timing. 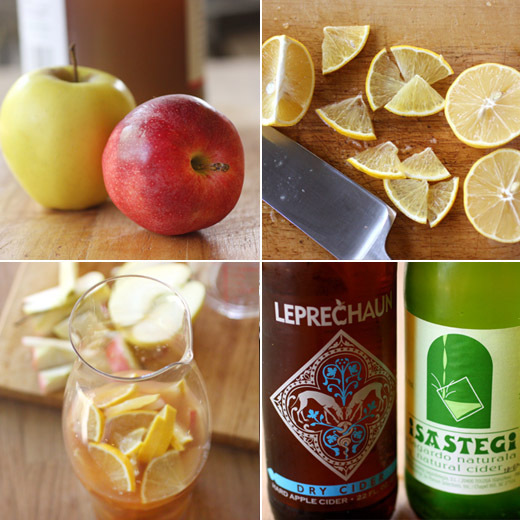 It’s made with hard apple cider, apple juice, lemon juice, and a little brandy. You can slice the fruit and mix it with the brandy and juices in advance. Then, just add the hard cider right before serving. I had some fun shopping for the ingredients for this sangria. I was testing the new Isis Mobile Wallet app. The app offers a new way of making point of sale payments with your mobile device. At the checkout, you just launch the app, wave your device in front of the machine where you usually slide your credit card, and the payment is made. Since the app requires near field communication (NFC) to function, you need to use it on a device with that capability. Currently, iPhones do not have NFC. I received a Samsung Galaxy III and a stipend to use Isis Mobile Wallet, and was happy to be able to use it at Whole Foods where I shop regularly. It’s reassuring to know the security features of the app. Not only is a PIN number required to launch the app, the SIM card in the device is also secure. If your mobile device were to fall into the wrong hands, the app couldn’t be used and your account couldn’t be accessed. There were a few hiccups in getting my account set up within the app, but once it was working, it was easy to use. Within the app, you can view a list of businesses that accept it as a form of payment. And, another interesting feature is that those businesses can offer special discounts and other offers within the app. There was a Whole Foods coupon available the first day I shopped with Isis. Unfortunately, neither the employee at the checkout nor I could figure out how to make the coupon work. I asked about how to use it at the customer service desk, and the employees there weren’t sure either since this is such a new service. But, they happily paid me the amount I should have saved with the coupon. It’s a nice feature, and I’m sure all the parts of the app will just get simpler to use in time. For the sangria, I chose apples in two colors. I found some pretty, organic Golden Delicious apples and used small, red, organic Galas as well. There are also some orange slices in the sangria. The lemon juice came from a Meyer lemon I had just received in my CSA delivery. Then, I needed to decide which hard cider to use. One of my favorites is Leprechaun Dry which is made in Houston. Whole Foods always has Leprechaun, and that day I also found Isastegi which is a Basque cider from Spain. I’d never noticed it there before. I only tasted one cider on my recent trip to northern Spain since it wasn’t actually cider season, so I was excited to taste this one at home. I’ve learned that Spanish ciders tend to be very tart with a bit of flavor of beer yeast. It’s a different style of cider than American and English hard ciders. I enjoyed tasting the Isastegi, but it was tart, so I went with the Leprechaun for balanced, apple flavor. Depending on the sweetness or tartness of the hard cider you choose, you may want more or less lemon juice than suggested. 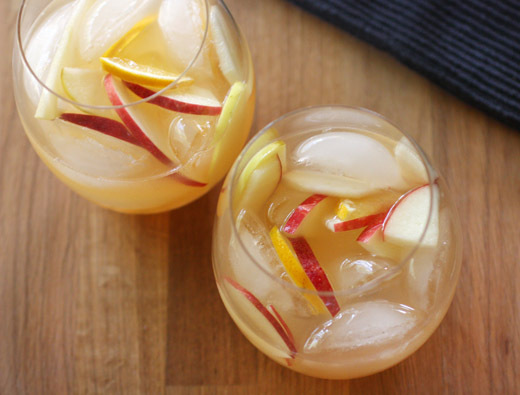 I’m betting this cider sangria will be a festive addition to Thanksgiving Day. I was contacted by M80 on behalf of AT&T to write about the Isis Mobile Wallet app. I received the Samsung Galaxy III device and a stipend to use within the wallet app. I’m enjoying this concept of tryouts for Thanksgiving dessert. Why didn’t I think of this years ago? It’s a perfect excuse to sample several desserts, test the recipes, and eventually make a decision for our menu. Today’s contestant hails from the LA Times. I believe I stumbled upon it two years ago when it was part of a slideshow of Thanksgiving dishes, but it was originally published in the paper in 2008. I hope you’re not thinking this is a light and healthy dessert with the fruit and cornmeal in its title. I wouldn’t want you imagining this isn’t rich and decadent enough for the biggest food holiday of the year. No, this is a buttery cake with plenty of eggs and ricotta to make the crumb very tender. There are also maple syrup and vanilla along with the orange zest and fresh cranberries. It has all the flavors we love at this time of year, and it’s easy to make. 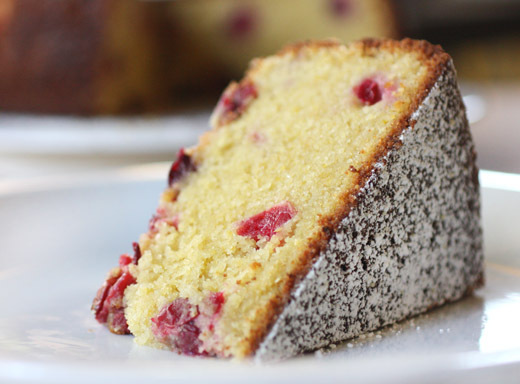 The recipe recommends using a nine-inch cake pan that is three inches tall. My cake pans are two inches tall. So, I used a nine-inch springform pan which is taller. You’ll want to butter and flour it well, and place a round of parchment in the bottom of the pan. My cake stuck on one side of the springform pan just a little. Next time, I’ll add a ring of parchment around the inside of the pan as well. The dry ingredients were whisked together, and those included flour, cornmeal, baking powder, baking soda, and salt. In a separate bowl, eggs, maple syrup, vegetable oil, and vanilla were combined. In the bowl of a stand mixer, butter, sugar, and orange zest were creamed. The egg mixture was added to the butter and combined. Then, the dry ingredients were mixed into the batter in two parts. 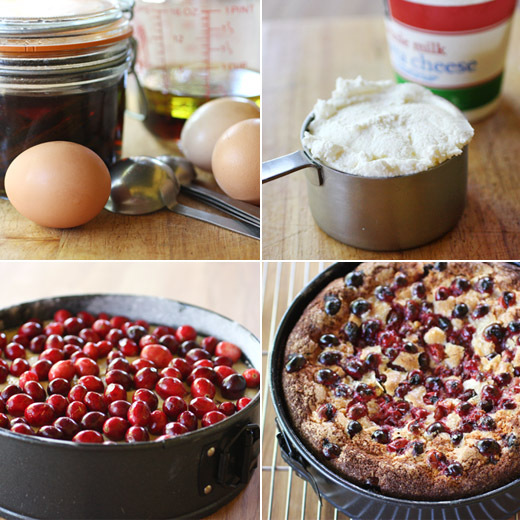 Ricotta was added with the second addition along with some fresh cranberries. The batter was poured into the prepared springform pan, more fresh cranberries were scattered on top, and they were topped with a little sugar. The cake baked for an hour and fifteen minutes. 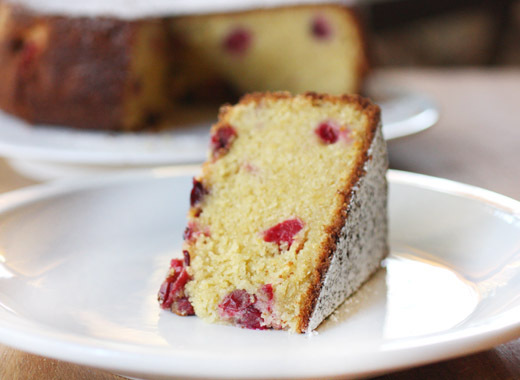 To serve, you can choose whether you’d like the cranberry surface to be the top or bottom. I flipped it so the top was completely flat. The cake was shown served with a scoop of vanilla ice cream. Since this was just a tryout, I served it plain with only a dusting of confectioners’ sugar. A dollop of maple whipped cream on each slice would be another nice way to embellish it for dessert. Or, I think this would make an excellent coffee cake for breakfast or brunch. Pies usually get more attention at Thanksgiving time, but we should make some room for cakes on the dessert table too. It’s that time of year. I can’t look at a pumpkin recipe and just go on about my day. I have to stop and try almost everything I see that’s made with pumpkin. It can’t be helped. 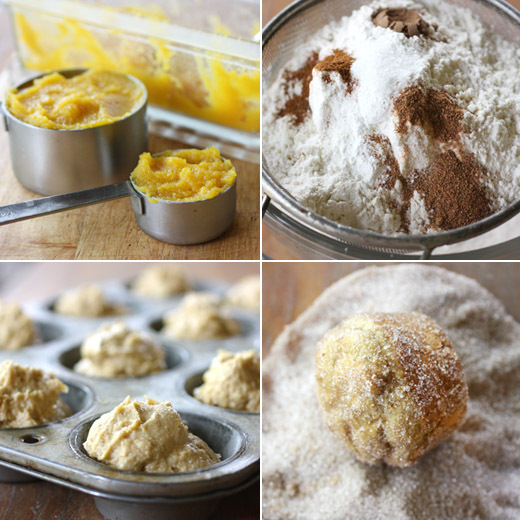 The other day I happened upon a slideshow of pumpkin recipes on the Martha site, and when I saw these Pumpkin Doughnut Muffins, I could not resist. I had some pumpkin puree on hand after making the Pumpkin Roulade, so there was really no reason not to go ahead and make the muffins. They’re cakey and tender with the pumpkin puree and butter, and the spices give them that lovely pumpkin pie flavor. When they come out of the oven and have cooled a bit, they’re brushed with melted butter and rolled in cinnamon sugar. They would be perfect for breakfast on Thanksgiving morning or every morning for the rest of pumpkin season. To start, the dry ingredients were sifted together, and those included flour, baking powder, baking soda, salt, nutmeg, and allspice. I added cinnamon as well. In a separate bowl, buttermilk and pumpkin puree were whisked. In the bowl of a stand mixer, butter was creamed with light brown sugar, and two eggs were added. Then, the dry ingredients were mixed into the butter in three stages alternating with the buttermilk mixture. The batter was spooned into buttered muffin tin cups. 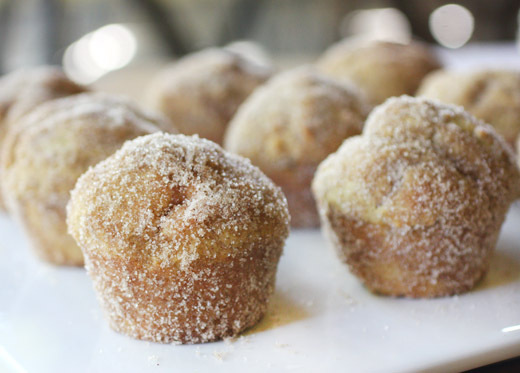 You don’t want to use muffin tin liners here since the baked muffins will be coated with butter and cinnamon sugar. The muffins baked for about 30 minutes. 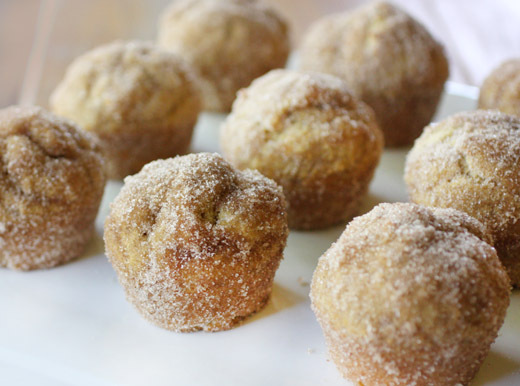 After cooling for about ten minutes, each muffin was brushed with melted butter and then rolled in cinnamon sugar. Pumpkin puree seems to work some kind of magic on the texture and flavor of whatever it’s mixed into, and the resulting cake, bread, or muffin always lasts well too. I’ve come to believe that baked goods with pumpkin cannot possibly be bad. Do you have a favorite pumpkin recipe I should try next? I’ve always been a picky eater. When I was little, I could not abide onions in my food especially in spaghetti sauce. It’s probably the primary reason I learned to cook. Spaghetti sauce was one of the very first things I ever made by myself. 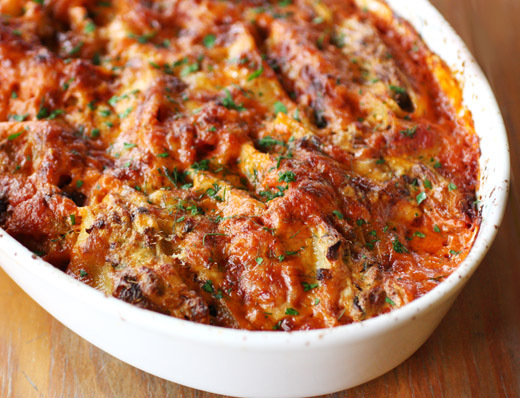 From there, learning to make lasagna with homemade sauce was an easy jump, and stuffed shells were the same as lasagna only the cheese filling is spooned into the shells instead of being layered between sheets of pasta. So, stuffed shells and I go way back. I’ve been making this dish for years, and I’ve changed up the cheese stuffing at different times. I’ve added chopped herbs or spinach. I’ve even used silken tofu mixed with ricotta. I saw this version of stuffed shells in the October issue of Food and Wine, and this was a twist on the classic I’d never tried. 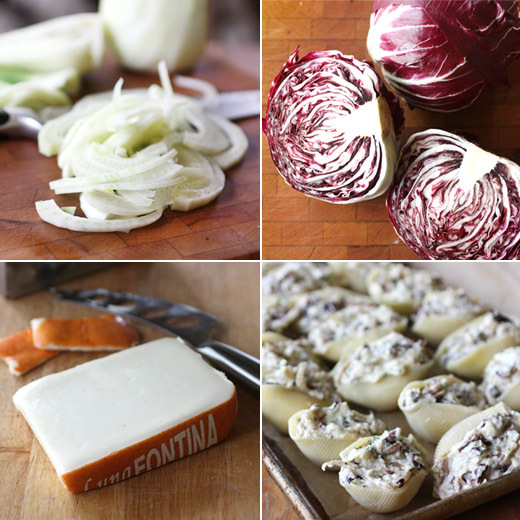 Fennel, onion, and radicchio were sauteed and then added to ricotta with some grated fontina. As a kid, I never would have gone for this combination, but I’m a little less picky in some ways these days. Oddly, this recipe starts with the instruction to pre-heat the oven. You won’t actually need to do that until you start stuffing the shells. First, you saute thinly sliced fennel and, in my case, minced onion in olive oil and melted butter. I still have an onion phobia and always mince them. Some things never change. Once the fennel is very tender and lightly browned, chopped radicchio is added. The quantities for fennel, onion, and radicchio seemed a bit too large to me. I ended up only using a little over half of the vegetables, and I stored the rest in the freezer for next time. Once the vegetables are sauteed and completely tender, they were left to cool and then added to a mixing bowl with two beaten eggs, some ricotta, grated fontina, and chopped parsley. Meanwhile, water was brought to a boil, and jumbo pasta shells were partially cooked. The shells should be pliable enough to stuff, but not completely cooked through. There’s a homemade marinara sauce recipe included in the article, and I had made the sauce in advance. Whole, canned tomatoes were used along with garlic, tomato paste, and basil, and thankfully, there was no onion. Some of the sauce was spooned into a baking dish, and as each shell was stuffed, it was placed on top of the sauce. More sauce covered the shells, and additional grated fontina was sprinkled on top. The shells were then baked for about 40 minutes. It’s interesting to taste the radicchio as it sautes and the bitterness wanes. Pairing it with fontina also levels off any remaining hints of bitter flavor. I admit I still have a thing about onions. I like the smell and flavor of onions but have no appreciation for any noticeable chunks of onion in dishes. Hence, I always mince them. I’ve completely changed my mind about every other vegetable though and was thrilled with all the colors, textures, and flavors in this cheese stuffing. 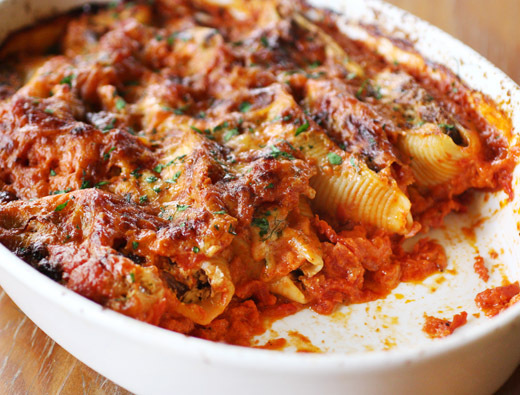 Besides, stuffed shells have always been easy to like. 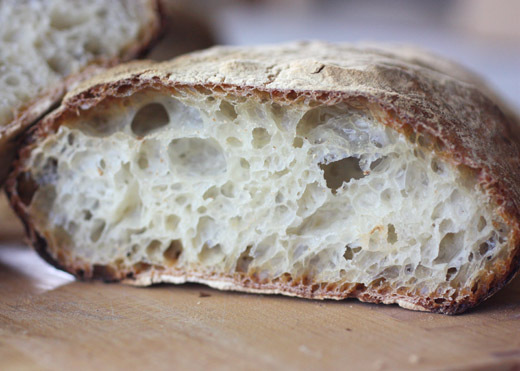 You might be thinking “ciabatta, so what?” But wait, this is big news around here. For the longest time, I had a ciabatta issue. It was my bread nemesis. I could not make good ciabatta to save my life. I tried several different recipes, repeated the attempts, and had flat, boring loaf after loaf with no airy, holey structure to be found. I would sulk and avoid wet doughs all together for weeks, and then when the sting of defeat had dulled, I would eventually try again. I was sure there was something wrong with me like I was missing the gene that allows a baker to produce good ciabatta. Just last week, I worked up the courage to try it one more time, and boom, believe it or not, I finally got great results. I’ve been reading Bread: A Baker's Book of Techniques and Recipes by Jeffrey Hamelman, and that’s what inspired this latest attempt. No matter how many bread making books I read, I always learn new things when I pick up another. This book breaks down each step of making bread and clearly describes not just what to do but why and exactly how. For mixing dough, there’s a chart that shows the time necessary for different types of mixers since speeds vary. The book is detailed enough for instructing professional bread bakers, and it’s extremely informative for curious home bakers as well. Because of the chart, I knew exactly how long to mix the dough at each step of the recipe for ciabatta, and I finally got the proper gluten development that was off in all those other attempts. As the dough fermented, I could tell it looked better this time. I didn’t get my hopes up until I pulled the loaves from the oven, but I was pretty sure the dough was headed for success. 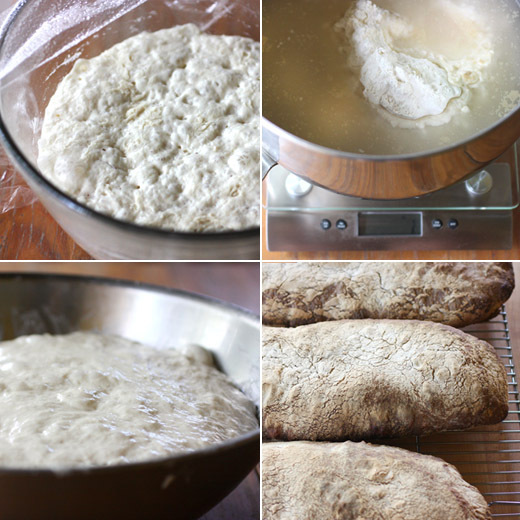 I used the formula for Ciabatta with Stiff Biga. There are a couple of other varieties of ciabatta in the book as well, and I’m thinking of trying those next to see if my luck continues. The biga was mixed about fourteen hours before I planned to make the bread dough. Bread flour (6.4 ounces), water (3.8 ounces), and an eighth of a teaspoon of instant dry yeast were mixed, covered with plastic, and left to grow overnight. It is a rather dry mix, but the biga grew into a domed shape by the next morning and was ready to go. In the bowl of a stand mixer, bread flour (1 lb. and 9.6 ounces), water (1 lb. and 3.6 ounces), salt (.6 ounce), and .13 ounce instant dry yeast were combined. After mixing on low for a few minutes, the biga was added in chunks. The recipe is written for a spiral mixer which is common in commercial kitchens, so I referenced the handy chart which converted the mixing time for a standard KithenAid stand mixer. I mixed on second speed for five minutes. 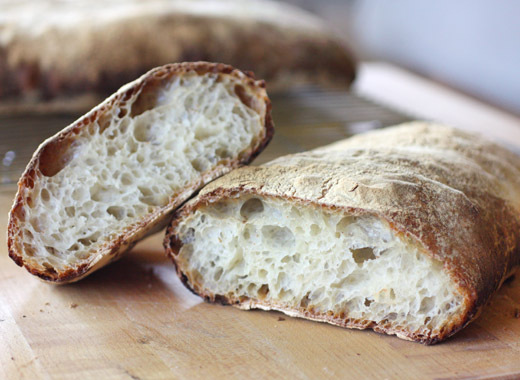 It’s worth noting that wetter doughs like ciabatta develop more slowly than drier ones, and extra mixing helps in creating dough structure. I transferred the dough to a big, oiled bowl for the three hour bulk fermentation. During that time, the dough needed to be folded twice, and the folding is another thing that helps in creating dough structure. And then, I veered from the instructions. Rather than pouring the dough onto a floured board to do the folds, I just folded the dough in the big, wide bowl. If you remove the dough from the bowl for folding, you should try to avoid working in extra flour. Extra flour can appear as white lines in the bread when it’s cut. So by folding in the bowl, no flour is even needed. After fermenting, the dough was active and bubbly. I turned it out on a well-floured surface. I prepped three sheet pans with parchment dusted with semolina. I divided the dough into three portions and placed them on the parchment-lined pans. Wet dough like this isn’t shaped other than being carefully pulled into a rough rectangle while hoping none of the gas bubbles deflate. The loaves were left for a final fermentation of one and a half hours, and the oven was heated to 460 degrees F. I left the loaves on the parchment pieces and loaded them onto the baking stone with a peel. They baked for about 36 minutes with steam added in the first five minutes. As promised in the book, the loaves had a “thin, blistered crust” that “splintered” when cut. The crumb was delightfully chewy and holey and everything that my previous failed ciabatta attempts were not. Now that I’ve finally found success with ciabatta, I’m excited about bread baking again. Maybe now some other kind of bread will become my new nemesis.